Thanks to a well-timed Groupon, I scored a 10-visit punch card to Birkam Yoga Natick for a very good price. Since I have a couple of weeks off from work (oh, painting the house, how I love and loathe thee), it seemed like a good time to try out this particular brand of yoga – hot, prescriptive, and athletic. Okay, first truth time here: I’m not flexible. Nor do I enjoy spending a lot of time contemplating where I fit into the universe. And frankly, I hate sweating. So the choice of very bendy, heated YOGA? Weird, but that’s exactly why it was on the list. And second truth time here: I enjoyed it. Sure, tomorrow when I go I’ll bring a bigger towel (and a second towel as well) and will wear far fewer clothes. But I’ll go back, which is probably the biggest surprise to me. I think what appealed to me about it was the athleticism involved – there is a lot of good balance work, and (as I said earlier), it’s a bendy brand of yoga. As it turns out, I’m a pretty goal-oriented person (shocking, shocking) and being able to walk out of there feeling like I had a workout was really appealing. Besides, I want to get better at being bendy – it can only help me in hockey and crossfit! So: score one for hot, bendy yoga that would have made me sweat even IF the room hadn’t been heated up. Yup, I did it. 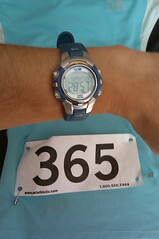 I ran 3.1 miles with a bunch of other people in a timed event. Never thought I’d be able to, especially since when I began working out in earnest a year ago, I couldn’t even run 200m without stopping. 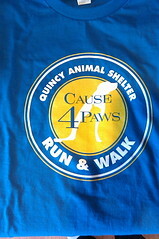 But sure enough, last Saturday October 16 I found myself in Quincy at Squantum Point Park picking up a number for the Cause 4 Paws second annual 5K sponsored by the Quincy Animal Shelter. Many thanks to Libby for giving me the heads-up on this race – several years ago she fostered a dog who had a litter of pups through QAS, one of whom she kept and is the wonderful Comet. I was lucky enough to get number 365 – how fitting given that I’m in the midst of 365 days’ worth of adventures! I did it! The tshirt is proof! 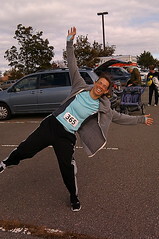 After picking up my stuff, I wandered back to my car to try to stay warm before the race began (it was WINDY!) I heard someone call my name, and looked over to see my teammate Danielle and her posse, also there to run the race (I’d sent out a plea a few weeks ago trying to get someone to run it with me, since Amy was working). It was so nice to have people to chat with, so I could get rid of some of that nervous energy that comes from doing something completely new with no one you know. Do it in less than 30 minutes. Happily enough, I accomplished all three goals! The course was flat and other than the incredible headwind at the very end (is the headwind ALWAYS at the end?) it was a great day for a run. It wasn’t a whole game, but it was half a game. It was way back on October 1… I need to catch up on my 40 in 40 posts! We were up 6-1 when I stepped in to the net. That should have been safe enough. We ended the game up 6-5. Thanks. blue team, for helping me out. I needed it! 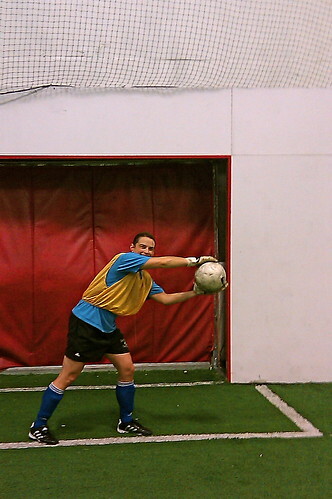 Obviously, my first attempt at being a goalkeeper was not my finest attempt. It may have been my final attempt, however, given how much I love having objects flying at my head, and how good I am at judging their speed and direction…. Two months ago, I made a public commitment to getting into shape, so that I’m stronger at 40 (10 May 2011) than I was at 20. One month ago, I joined CrossFit New England. After a month, it seems like a good time for a bit of reflection on this journey. First things first: I have blisters and callouses on my hands! A lot of people might view this as a bad thing, something to be avoided. I view it as a return to a different time in my life, a time in my life when I played on monkey bars and jungle gyms, when I could climb trees and not feel it the next day. This, perhaps more than anything, tells me that what I’m doing is good. Next: I have run a mile two times now. For those of you who know me in person, you will understand the significance of this. My motto for years has been: I will run when someone chases me. Well, the person who is chasing me happens to be (with apologies to Dickens) the Ghost of Megan Future and I’m gaining on her, slowly. Also: I am close to being able to do a real pullup. My goal for the month is to be able to do one, although I’d be even happier if I could do 2 or 3 in a row. When I watch all the other folks at the gym doing pullups I get a little bit jealous, but that jealousy motivates me to keep on trying, keep on trying. More: I had no idea I could push myself this hard. Turns out that despite what I believed for years about how I “do” fitness (i.e. solo, self-directed), I was wrong. The way I took to hockey should have clued me in, and if that didn’t, the fact that I started playing indoor soccer last winter should have. But apparently neither of those things registered, and the other day I had this moment of thinking, “Holy crap! I LIKE to work out in a group, to cheer for other people, and to have them cheer me on, push me, tell me I do just one more.” Go figure. And: I couldn’t have done any of this in a non-CrossFit setting. I’ve worked out before and know that when I do, I get into certain routines. With a routine, it’s easy to remember what to do, to not have to think about it. Of course, routine is a real buzzkill and what’s more, it is boring (thus decreasing the likelihood that I’ll keep it up). What I like about CrossFit is that I don’t have to decide what my workout is. I show up, the workout is on the whiteboard. Some of them look killer (and are), while some look easy (lies and deception, every time I think that). But the fact is, it’s easy for me to remember what to do at CrossFit without a routine, simply because someone else is thinking about what we’re going to do each day on everyone else’s behalf. The prescribed workouts may seem limiting, but for me, they’re totally freeing. Finally: CrossFit really is a supportive community. I’ve met a lot of new people, the sorts of people I don’t see in my everyday life. First off, there are a lot of guys who work out there. I don’t spend a lot of time with men, working at a women’s college with well over half the employees in my division being women. Second off, I suspect that a large number of the people who work out there don’t share my educational level, sexuality, political leanings, and/or worldview. And you know what? It doesn’t matter, because what we’re all doing there is getting stronger, faster, and fitter. That’s the thing that unites us. And in the meantime, I just might expand my horizons a bit. So you may be wondering: Has Megan drunk the CrossFit Kool-Aid? Well, I have, but not all of it quite yet. I’m a skeptic by nature, and there are parts of the CF philosophy that I’m still struggling with, particularly those parts around fuel for the body. I feel a need to do more research, to find evidence and data that the way many CrossFitters eat is rational when some of it is counter to what I’ve learned in the past. And really, I can only make so many changes in my life at once. Adding in 4-5 trips to the gym each week (from ZERO) is a lot to get used to. Try me in another couple of months and maybe I’ll have found my evidence and data, changed some more things about my life. And maybe not. But in a couple of months, I can tell you, I will still be going to CFNE and loving the way I feel. It comes as no surprise to most who read this blog regularly (hi, all 5 of you!) that I play hockey. Actually, I don’t just play hockey, but I am obsessed with it. I’ve done camps, clinics, power-skating, mixed-level leagues, higher-than-me-level leagues, and just-my-level leagues. I play during the academic year (aka the “regular” season) and I play in the summer (aka the “OMG I’m in three leagues” season). I love to play in tournaments with my regular season team(s) and I love to play in tournaments with tournament teams. You might think that with all that hockey-playing, I’d be in good shape. You’d be only about 1/4 right. The parts of me that are strong and in shape include my skating muscles (mostly in my glutes, hams, and calves) and my stick-handling muscles (mostly my shoulders). But they are strong in very sport-specific ways. And you may notice that there is a lot more of my body that I didn’t list as being in shape (arms, abs, quads, chest, back, etc.) My cardio system is in hockey-shape, not necessarily in good shape. In other words, I can skate hard for an hour (with the usual breaks) and not be horribly winded, but that’s only with skates on. Take the skates off and it’s a different matter entirely. I recently turned 38 (okay, several months ago – where the HELL did summer go?) and this has been weighing on my mind a lot since then (pun totally intended). Over the course of the past 6 weeks or so, I’ve been doing a bunch of research into ways to get myself into better shape. I finally hit on the thing I think will work – it’s called CrossFit. You can google it to find a bazillion web sites out there on it, but for me it wasn’t that kind of research that sold me. No, it was seeing 2 people I know change during the time they’ve been doing CrossFit. Karin, first and foremost, I’m looking at you. You started out as no slouch, but now? Wow. You look strong and healthy and ready to take on the universe. Brian, you too. I know you’ve been doing it for a year on your own, and I appreciate all the info you gave me on how to get started. And honestly? You look better now than you did a year ago when I met you, stronger and healthier too. There’s also a social aspect to this, as well as a competition to it. Right up my alley! I am going to give CrossFit a shot – a month on my own, and then into the local CF gym till the end of 2009 and beyond. I’m tired of only being in-shape for one thing (even though it is one thing that I LOOOOOOOOOOVE). It’s time, and I’m saying it out loud. My public commitment is this: I will be stronger when I hit age 40 than I was at age 20, starting yesterday. Bring on the next 21 months!